In a bid to appeal to young car buyers, the cool, well shot new TV commercial from TATA Nano highlights key USPs of the car and revolves around a central theme that calls out that the journey matters more than the destination. Don’t we all agree! TATA Motors is also making the most of social platforms to reach its Target Audience of choice. On Facebook, in addition to consistent brand page updates, the brand executed the Logout banner today. The Facebook brand page has a 2.6 million strong fan base that Nano can leverage for immediate reach. Winners can walk away with Nano branded merchandize and one lucky winner gets to win the Nano! 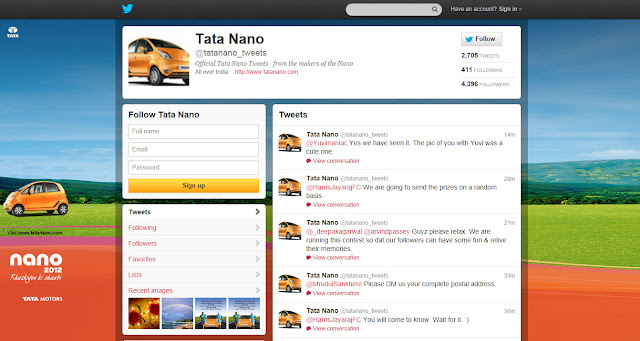 What’s interesting is that TATA Motors persistently explores fresh new initiatives for Nano whether it is on Social Media, or branded merchandise on Ebay or just one-off fun promos.